Midcentury modern tours now are taking place in cities all over the country. Renewed interest in this era capitalizes on the millennials’ interest in design from a time that seems almost impossibly optimistic compared to today’s zeitgeist. Most cities around the country boast a healthy building stock from this postwar period, nicknamed “the suburbs,” although these are ritually condemned – and designated for annihilation – by academics, urban land speculators and the urban clerisy. Yet the new interest in the mid-century modern form reflects its basic and enduring appeal. As the curious and the trendy take bus tours of these inner-ring neighborhoods, the forms of this era evoke a sense of great confidence and faith in the future, both of which seem to be lost in the obsession with neo-traditional forms that hearken to the pre-car era or to the cartoonlike, sculpture-as-architecture one sees in many urban centers. Suburban expansion after World War II reached out beyond the streetcar systems that created the traditional neighborhoods of the late 19thand early 20th Century. The returning GIs wanted something simple and affordable to begin their lives after serving their country. Confidence surged in America’s know-how and ability to solve even the deepest social problems. The triumph of science and technology was a palpable presence. The dark side, of course, was the atomic threat, restraining our enthusiasm but only a little. In this midcentury era, planning and design began to be car-based. 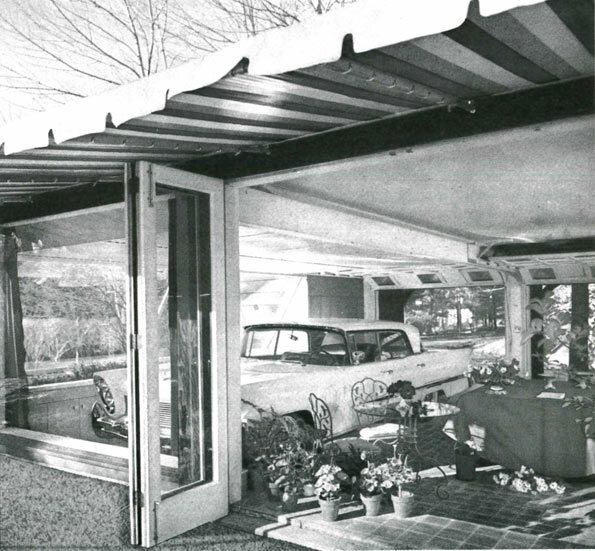 Residences were designed to show off the car, putting it out front for display – and some home plans even had tailfinned beauties in the living room. Consumer goods were no longer accessed on foot; a new form of luxury consisted of driving up to the front door of a shop with parking in front. Front-loading houses and stores became unquestionably more efficient as a means to accommodate the new American lifestyle. Yet despite the auto-orientation, the architecture of this era retained the pedestrian scale and intimate feel that marked Main Street before World War 2. This both/and aesthetic marks the form of the 1940s and 1950s, with streamlined design styles like Art Deco Revival and materials like glass and stainless steel. Gentle angles suggested motion, and the theme of mobility was everywhere in the architecture. Wider streets and lower, longer horizontal lines accommodated this theme and even today the architecture reinforces a feel of motion when driving past these structures. Modernism also formed a certain ethic. To be modern was more than a lifestyle choice; it was an acceptance of science, knowledge, and technology, free from preconceptions. At the time, modernism elevated architecture above the style debate, and was considered even a shedding of styles. The politics of the time was similarly marked by Truman’s “straight talk”, and there was a shedding of rhetoric and posturing that lasted up until Joe McCarthy began once again a divide-and-conquer campaign against people. Translated to the suburbs, modernism meant practical homes, without the adornment that marked Victorian architecture. Instead, modernist residences were marked by deep horizontals and large picture windows, providing a sense of openness that was a hallmark of modernist thought. Floor plans also were open, allowing free movement through space, rather than cutting the house up into cluttered little parlors, dining rooms, or nooks. Today, midcentury modern design is fetishized for mass consumption in magazines like Dwell that emphasize acquisitiveness over ethics. But back then, the design meant something else, something cleaner and more powerful. In the 1950s, modernism meant consumption, but even more, the modernism defined the quest for the inner self and a new, forward looking outlook. By reducing modernism to a sofa style or wallpaper pattern, we risk losing all that this era stood for. Buildings from the 1950s have sustained themselves through multiple recessions, the rise of the internet, cultural acceleration, massive city growth, and globalism. So perhaps they point towards a real definition of sustainability by having good bones and adapting through all these changes. Developers seeking first-time homebuyers, however, respond to the regulatory climate, which favors solutions like garages on alleys, big homes on tight lots, and neotraditional styling. Bonus density and other zoning incentives rig the game in favor of this highly regulated development pattern, even in the exurbs. 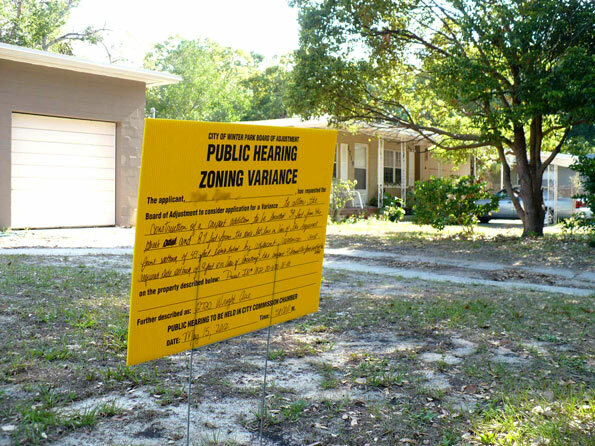 Here in Central Florida, the development zone nicknamed Horizon West has been codified to enforce these form-based principles, with stiff permitting fees and a highly participatory government staff to keep things on the straight-and-narrow. Keeping prices low with all this overburden requires developers to cut the cost of the home drastically, likely reducing lifespan of components and systems. Ironically, the house meeting these tortured standards of today is less sustainable than the house built in 1953, with better bones and an adaptable floor plan. Meanwhile, these 1950s neighborhoods are under attack for their very form. Cities, persuaded by planners to heal the effects of the car, cannot do so in a granular manner, so ordinances are passed forbidding front-facing garages, or garages set back arbitrarily from the house front. These 1950s homes, with their carports, couldn’t be built today, and so are reduced to the status of heritage sites from a bygone era. In Winter Park, garages are banished to the rear on new homes, and if you are adding a garage to your midcentury home, it must be arbitrarily set back at least four feet from your front wall whether or not your lot can accommodate this arbitrary, and seemingly pointless, ordinance. Of course mid modern tours allow people to rediscover the essence of the 1950s, and these overlooked neighborhoods could be the springboard for a new era in modern planning. Front-loaded neighborhoods can be successful when the architecture is designed at a human scale, and fine-grained integration of residential and commercial uses point to a future of home-office, cottage-industry, people-based industry once again. The Victorian era ended rather abruptly in the 1890s with a series of economic catastrophes that changed America’s middle class. Architecture switched to a more streamlined, Edwardian style – simple, flexible, and utilitarian forms that quickly gave rise to modernist design. This current economic transition may well bode a similar outcome – design styles, often labeled “contemporary,” reduce the amount of architectural gingerbread and fussiness, reducing cost and maintenance, and may be favored by the coming generation for its cleanliness and utility. A new era that manages the car at a human scale, forgives people for wanting mobility and efficiency, and allows for contemporary exploration of style and design can and should inform new neighborhood planning. Midcentury suburbs, rediscovered by popular interest, can point the way to a middle ground between mcmansion-style subdivisions and neotraditional fussiness, and maybe even help us rediscover our confidence and faith once again. This essay is a summary of Richard Reep’s talk “Populuxe and the Atomic Bungalow” given at the 3rd annual Colloquium on Historic Preservation, hosted by Friends of Casa Feliz, Winter Park, Florida in April 2012. 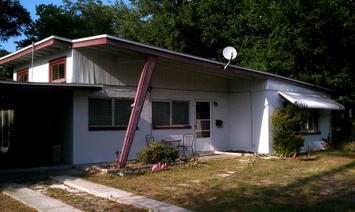 Richard and his wife, Kim Mathis, hosted a midcentury modern tour in their own 1950s home for the colloquium.